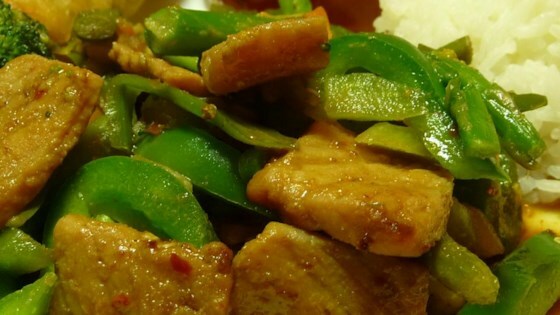 "A sweet and mildly spicy stir fry dish that is easy on the waistline! Can also be made with chicken! Goes great with jasmine rice. I mix and match veggies to whatever I have or whatever I feel like." Mix the sliced pork, 1 tablespoon hoisin sauce, and 1 tablespoon cornstarch together in a bowl. Set aside. Combine the remaining 2 tablespoons hoisin sauce, chicken broth, and 1 tablespoon cornstarch with rice vinegar, sugar, and cayenne pepper in small bowl. Set aside. Heat the sesame oil in a skillet over medium-high heat. Stir in the pork; cook and stir until the pork begins to brown, about 5 minutes. Add the garlic and ginger; cook and stir until fragrant. Mix in the carrot, bell pepper, and water chestnuts, cooking until the carrots are tender. Stir in the reserved hoisin sauce mixture and continue cooking and stirring until the flavors are combined, about 3 minutes. Used chicken instead of pork; otherwise followed recipe exactly and it came out great! Was easy to make and 3 out of 4 of my family liked it, so it gets 4 stars. Enjoy! Not bad, kind of sweet.